Here are the top hotels for your Red River ski trip! This hotel in Red River features free Wi-Fi, free parking, and features a kitchen/kitchenette in each guest room. At the base of a Red River Ski Area chair lift, this Bavarian-style riverside resort sits amidst a private park that is a wildlife sanctuary. It is steps from shopping and dining on Main Street and 20 miles from Eagle Nest Lake State Park. Warmly furnished rooms have flat-screen TVs with cable channels. 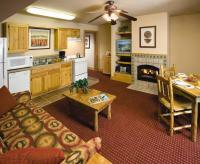 The 1- to 4-bedroom cabins and apartments add kitchens and living rooms. Amenities include barbecue grills, a fitness room, a sauna and hot tubs. Parking is also available. The private park offers trout fishing along a 1,000-foot stretch of river. Set in the Carson National Forest and along the Red River, this relaxed hotel is a 5-minute walk from the Red River Ski Area. Traditional rooms have free Wi-Fi, coffeemakers and 42-inch flat-screen TVs, as well as microwaves and minifridges. Some quarters offer bunk beds and/or balconies. Upgraded lodgings feature kitchens. Continental breakfast is complimentary and served in the casual dining room. There's also a hot tub, a business center and on-site parking.